In addition to manufacturing new rollers, Mid American Rubber also specializes in recovered rollers by reconditioning existing rollers. Through our in-house process your used roller can be renewed to a “like new” state saving you time and money compared to designing new rollers. All cores are inspected upon receipt and checked against OEM blueprints for journal specifications and straightness. 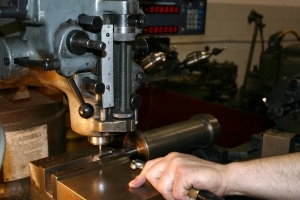 All repairs are performed in our on-site machine shop. Undersized or worn journals can be built up and repaired to meet print specifications. Mid American Rubber maintains various highly precision grinders and lathes that our experienced operators set and check to maintain uniformity, close tolerances, and specific diameters throughout an entire order of parts. At Mid American Rubber, we have the experience and machinery to meet customer specific finishes and special grooving to optimize our customers’ applications.